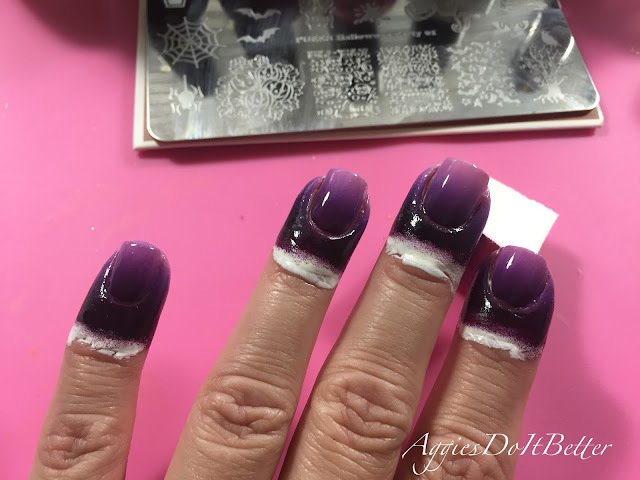 Aggies Do It Better: Halloween 2016: purple ombré graveyard....sort of! 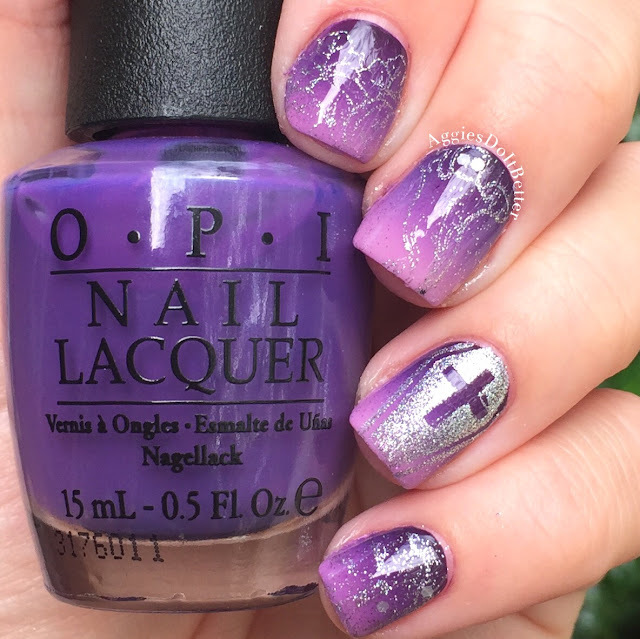 Halloween 2016: purple ombré graveyard....sort of! Today I have a not so non-traditional look....I've been wanting to try this purple ombré gradient look so many people do for Halloween for years! I decided this was the year to try it, and at the same time make it not-so-graveyardy. For the ombré gradient I used Lucky Lucky Lavender, Funky Dunky (bottle shown) and Lincoln Park After Dark. I took a couple quick pics of the process! I used white liquid latex to protect my fingers from the mess....I'm still not that great at gradients because I don't practice it enough! The latex definitely helps with the mess which really discouraged me from doing them in the past. I left it on while I was drying and waiting to stamp. 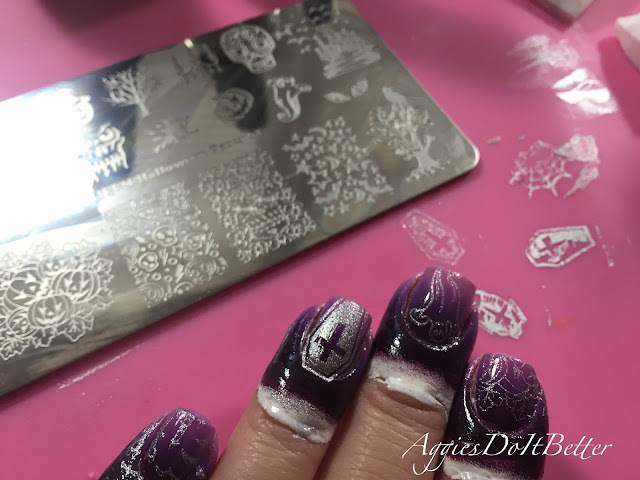 I used This Gown Needs A Crown for the silver stamping. 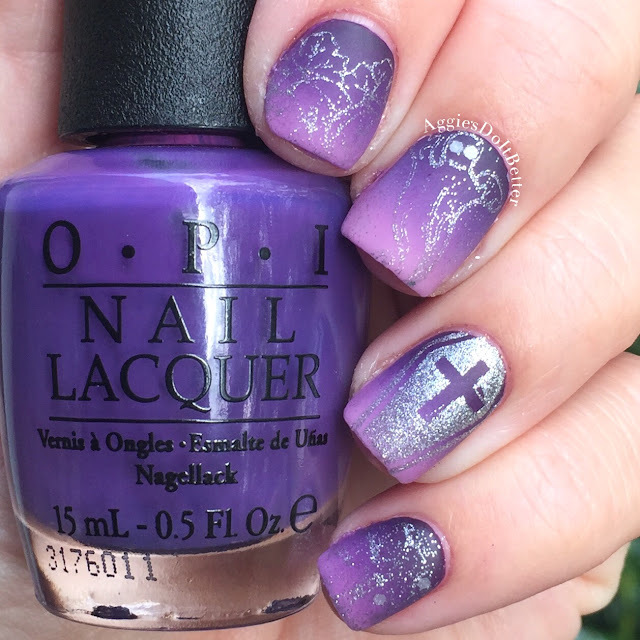 I wanted to use the OPI chrome but it just wasn't picking up! Frustrating! You can see all my little practices on the mat. I just sort of chose a few designs to go on top. I also used a little bit of Pirouette my Whistle (glitter topper) but it covered too much of my partial castle on my pinkie! Dangit! I used a much lighter hand on the rest of my nails. I also wanted to see what these looked like matte!